CHAPTER I. EARLY LIFE: LITERARY AND POLITICAL WRITINGS. David Hume was born, in Edinburgh on the 26th of April (O.S. ), 1711. His parents were then residing in the parish of the Tron church, apparently on a visit to the Scottish capital, as the small estate which his father Joseph Hume, or Home, inherited, lay in Berwickshire, on the banks of the Whitadder or Whitewater, a few miles from the border, and within sight of English ground. The paternal mansion was little more than a very modest farmhouse, and the property derived its name of Ninewells from a considerable spring, which breaks out on the slope in front of the house, and falls into the Whitadder. Both mother and father came of good Scottish families—the paternal line running back to Lord Home of Douglas, who went over to France with the Douglas during the French wars of Henry V. and VI. and was killed at the battle of Verneuil. Joseph Hume died when David was an infant, leaving himself and two elder children, a brother and a sister, to the care of their mother, who is described by David Hume in My Own Life as "a woman of singular merit, who though young and handsome devoted herself entirely to the rearing and education of her children." Mr. Burton says: "Her portrait, which I have seen, represents a thin but pleasing countenance, expressive of great intellectual acuteness;" and as Hume told Dr. Black that she had "precisely the same constitution with himself" and died of the disorder which proved fatal to him, it is probable that the qualities inherited from his mother had much to do with the future philosopher's eminence. It is curious, however, that her estimate of her son in her only recorded, and perhaps slightly apocryphal utterance, is of a somewhat unexpected character. "Our Davie's a fine goodnatured crater, but uncommon wake-minded." The first part of the judgment was indeed verified by "Davie's" whole life; but one might seek in vain for signs of what is commonly understood as "weakness of mind" in a man who not only showed himself to be an intellectual athlete, but who had an eminent share of practical wisdom and tenacity of purpose. One would like to know, however, when it was that Mrs. Hume committed herself to this not too flattering judgment of her younger son. 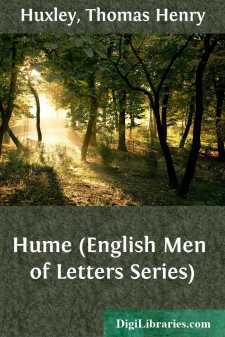 For as Hume reached the mature age of four and thirty, before he obtained any employment of sufficient importance to convert the meagre pittance of a middling laird's younger brother into a decent maintenance, it is not improbable that a shrewd Scots wife may have thought his devotion to philosophy and poverty to be due to mere infirmity of purpose. But she lived till 1749, long enough to see more than the dawn of her son's literary fame and official importance, and probably changed her mind about "Davie's" force of character.